As with all major holidays celebrated in the family, I’m in charge of dessert this Easter. And as my grandmother is a big fan of chocolate, this cake always goes down a treat. It’s not your classical Easter dessert, my mom is in charge if that as I’m not a fan of it and I only bake what I like myself. But you may like it, so I’ll make sure she takes a nice picture of it so I can post it for you to try it later. Right now, it’s back to chocolate with the addition of coffee and coffee butter icing, a recipe I found in Rachel Allen‘s Bake, so you can’t really go wrong there! Preheat the oven to 180 C and line a loaf tin with parchment paper. Put 175 g self-raising flour in a bowl with 50 g cacao powder and 225 g soft light brown sugar and stir to combine (the recipe says you should sieve the flour ad cacao powder first, but I usually can’t be bothered). Beat in 175 g melted butter (just pop it in the microwave for not even a minute), 4 egg yolks (you will need the whites later), 60 ml very strong cooled coffee and 3 tbsp water. Whisk the egg whites until stiff (add a pinch of salt to make it easier, you should be able to turn the bowl upside down over your head without any of the contents shifting) and fold into the cake mix. Pour in the tin and smooth the top with the back of a spoon. Give the tin a tap by banging it gently on your work surface (you may want to put a towel in between for the noise) which will remove any air bubbles. Bake in the oven for 35 min, then reduce the temperature to 150 C for another 20 min until a skewer inserted in the middle comes out clean. 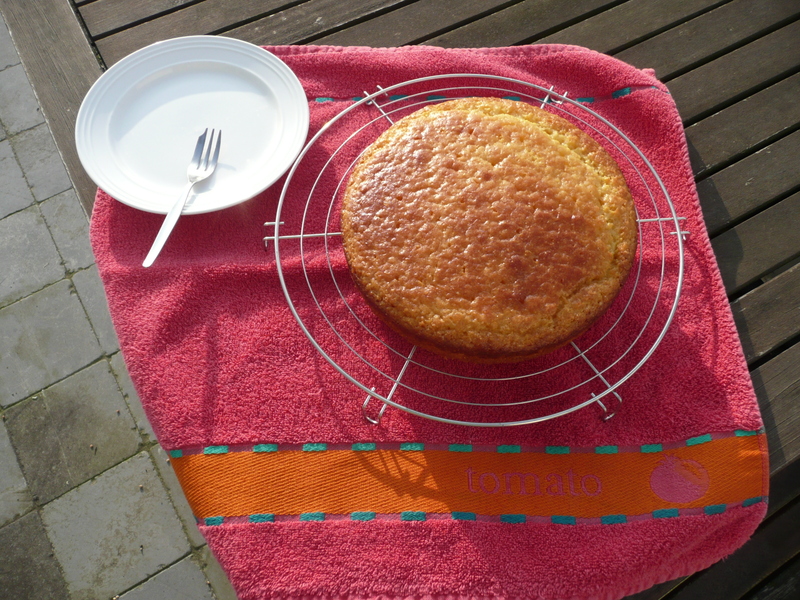 Allow the cake to cool in the tin for 10 min then transfer to a wire rack to cool completely. Make the coffee butter icing: place 100 g softened butter (if you keep your butter in the fridge, just pop it in the microwave for 15-20 min) in a large bowl and beat in 200 g icing sugar and 3-4 tbsp cooled very strong coffee. If your butter is too soft, it will become runny (as it did in my little experiment) but you can pop it in the fridge for am hour or so to stiffen up (I didn’t have time for that and went for the nice drizzled option). Now you can assemble: using a bread knife, split the cake horizontally and spread about a third of the icing on the lower half with a palette knife (or any big knife will do). Place the other half on top and spread the rest of the icing over it. You can limit it to the top so you see the layers, or you can go all the way round the sides as well, up to you! As a decoration, add chocolate curls, easter eggs, or any other decoration you want. It’s best to let the cake settle for 30 min before cutting and it will easily keep overnight as well. Enjoy while listening to Make me smile by Cockney Rebel! This is a real show stopper and it’s absolutely delicious too! If you’re not baking for a crowd, you can easily half the recipe as well. And if you’re planning on making this more than once, I have some time saving tips along the way. This is not your everyday cake, as it does take some time to make it, but it’s totally worth it! And there is a lot of licking the pot along the way, so there are some cook’s perks too! I found it in Rachel Allen‘s Bake, a book full of delicious recipes. 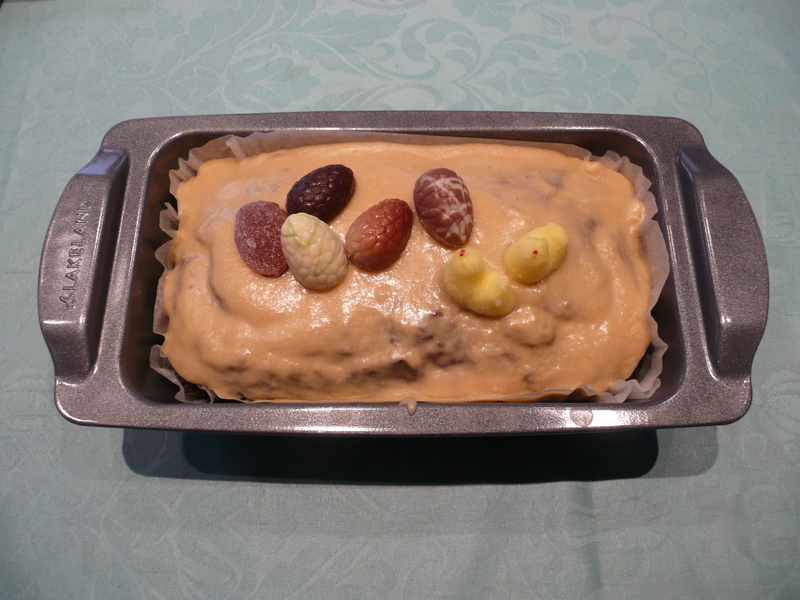 The recipe consists of 3 parts: making the praline, baking the cake and making the praline buttercream icing. Place 150 g caster sugar in a non-stick pan and set over a high heat until the sugar turns a caramel colour. Do not stir, but you may carefully swirl the pan to allow the sugar to caramalise evenly (a bit daunted? Check out this video on how to make caramel). 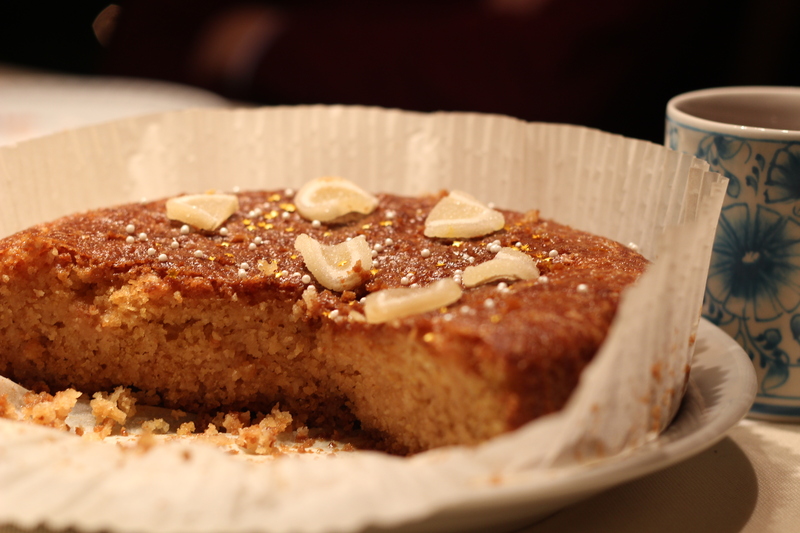 Scatter 150 g unskinned almonds over the top and swirl the pan again to coat the nuts. Pour the mixture onto a baking tray lined with parchment paper and allow to cool. When the praline is cool and hard, place in a food processor and whiz to a gritty powder. Alternatively, place the praline in a plastic bag and crush with a rolling pin. Preheat the oven to 180 C and butter and flour a 20 cm diameter cake tin (the recipe suggests 2 tins, so you can bake 2 cakes, which you each slice in half to add a layer of buttercream. 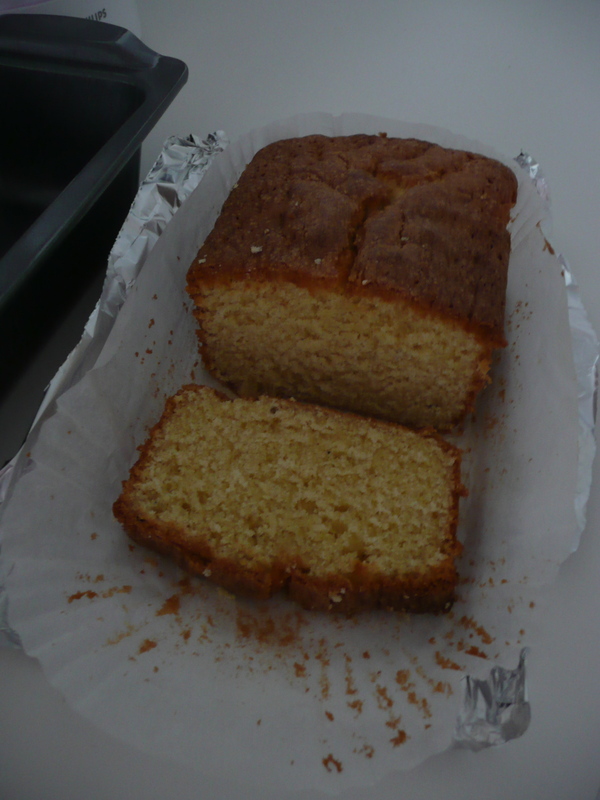 Being lazy, I stick to one tin and slice the cake in 2 or 3 depending on how well it has risen). Mix 225 g softened butter with 225 g caster sugar until fluffy and soft. Add 4 eggs one by one, beating well between each addition. Gradually stir in 225 g self-raising flour (or use regular four and add 1 tsp baking powder). 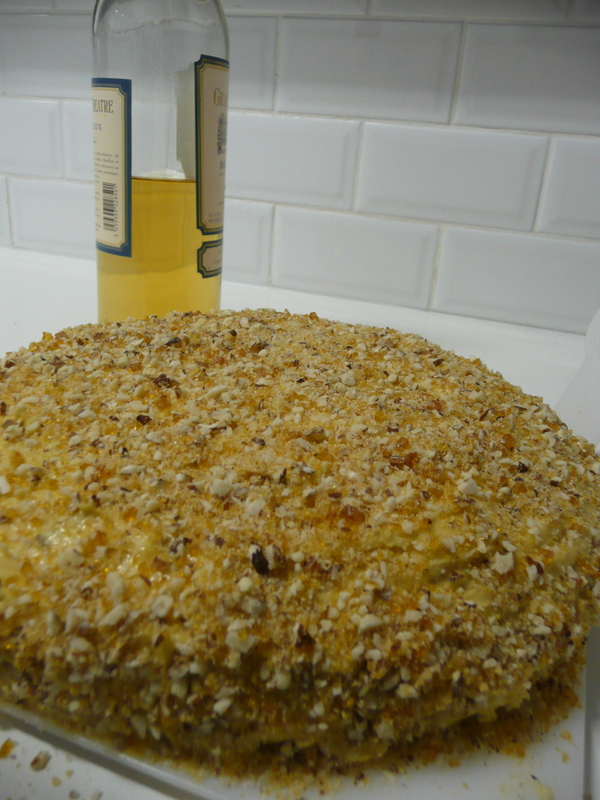 Add 6 tbsp of the crushed praline and mix lightly, adding 1 tbsp milk to moisten. Put in the prepared tin(s) and bake in the oven for 30 min (or 10-15 min longer if in 1 tin), or until a skewer inserted in the middle comes out clean. Allow to cool in the tin before turning out onto a wire rack. You can do this when the cake is in the oven, or you can make it upfront too. If you’re only making half a cake, you can still make all the icing and freeze half for next time. This is quite a big batch of icing anyway, so I usually freeze half and only use half to assemble my cake. In a saucepan, bring 125 ml water and 350 g caster sugar to the boil, stirring until the sugar dissolves. Turn the heat up high and let the syrup boil for 4-5 min to the ‘thread’ stage, when the last few drops that fall from the back of a metal spoon dipped into the syrup come off in one long, quite thick and syrupy thread. While the sugar is boiling, beat 7 egg yolks (you don’t need the egg whites, but you can freeze them for later use. just defrost and you can use them again) for 1 min, then very gradually add the hot syrup. Continue beating until all the syrup is added and the mixture has cooled. The consistency should be stiff, mousse-like and able to hold a figure of eight pattern made by the beater (this should take about 10-15 min). Place 350 g softened butter in another bowl and beat until very soft. Continuing to beat, gradually add the mousse, a spoonful at a time. Then stir in 1 tsp of vanilla extract and 12 tbsp of the crushed praline. If you still feel your arm after all that beating (or if you have a food mixer that does the work for you) you are now ready to assemble (if not, take a break, wrap the cake in foil so it doesn’t dry out and come back tomorrow). 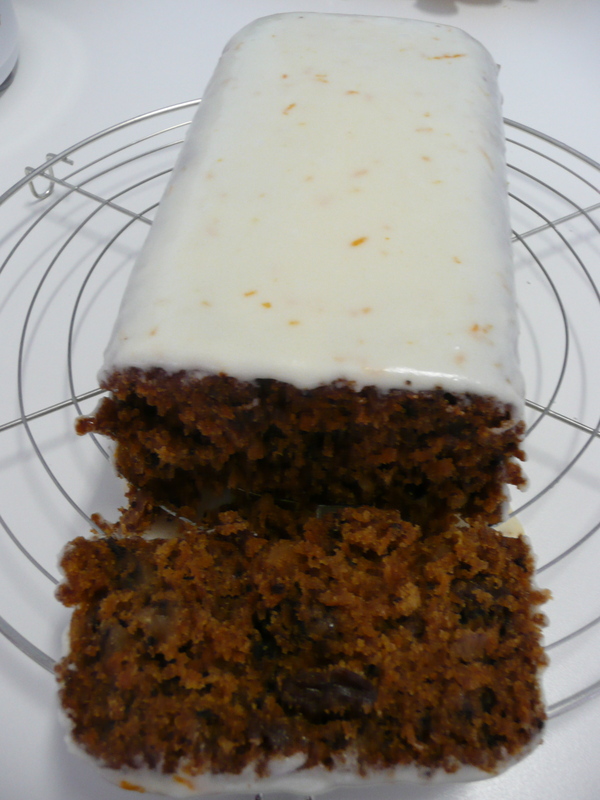 To assemble, slice each cake in half horizontally (or if you made 1 cake and it has risen well, slice it in 3. If you only made half of the recipe, you can cut the cake in half vertically and your cake in the shape of half a circle). Spread the inside of each cake sparingly with butter icing and and sandwich together, stacking each layer above the other as evenly as possible. Ice the top and sides with the remaining icing. Sprinkle the remaining crushed praline all over, including the sides. Serve while loudly saying “ta-da!”, after all that work, you deserve all the oohs and aahs. Enjoy! I’m a winter type: I love the cold, evenings in front of the fire, long walks on the beach when it’s freezing, and of course Christmas! So when I bought The Hummingbird Bakery’s Cake Days book, this cardamom loaf was one my “must try this”-list. Of course, it was summer, and cardamom is such a warm and wintery spice that I had to wait for the right time. I hear you say “but it’s still August?!”. Ah yes, but with the time we’re having, we’ve been complementing each other on what a lovely autumn weather we’re getting. And autumn is the right time for a cardamom loaf! Did you know that Belgium is now officially the wettest country in the world? We beat the UK, can you believe it? On the other hand, we’re finally a world champion at something… although that could be because of lack in participants. Anyway, back to the cardamom loaf! If you are wondering what to do with the rest of the cardamom, you can use it to make speculaas or you can add a few cardamom pods to the water when you’re boiling rice for a change in flavour, very delicious! Or just make more loafs, this is such a fast and easy recipe that it already became a favorite in my house! First, preheat the oven to 160 C and grease a loaf tin with butter and dust it with flour (or put a layer of baking parchment in it instead). Mix 190 g softened butter with 190 g caster sugar and the crushed seeds of 10 cardamom pods (split them and crush the seeds with a pestle and mortar) until the mixture is light and fluffy. Add 3 eggs one at a time, mixing well after each addition. Add 1/4 tsp salt and half of 190 g self-raising flour (or use plain flour and add 1 tsp baking powder), mix again and add the other half of flour again mixing until it is just incorporated. Finally, mix in 1 tsp vanilla essence and 25 ml soured cream (if, like me, you don’t have soured cream around, just use plain cream instead and add a splash of lemon juice, it works just as well). Pour the batter into the prepared loaf tin and bake for 50 min until the sponge is firm and a skewer inserted in the middle comes out clean. Allow the loaf to cool a little in the tin before turning out onto a wire rack to cool completely. I’m sure you can keep this cake for a few days, but I can’t say for sure, ours was gone too quickly! Enjoy! A colleague of mine recently brought a home-made tart to the office for his birthday. It was so delicious, that I stalked him for the recipe so he brought his cookbook from Australian chef Bill Granger, which also contained this recipe. Now if I see lime and mango both in one recipe, I don’t have to think twice! Straight to the copy machine it was and that night the cake was already in the oven! Heat the oven to 170 C and grease a 26 cm cake ring (or use a 22 cm round springform or whatever other combination of tins instead). In a large bowl, mix 180 g softened butter with 250 g caster sugar and 1 and 1/2 tsp lime zest (you need about 2-3 limes in total for this recipe). Add 4 eggs one at a time, mixing well after each addition. Fold in 300 g flour in two batches, alternated with 200 ml yoghurt, also added in two batches, adding 2 and 1/2 tsp baking powder with the final batch. Now fold in 1 mango cut in cubes and scoop the mixture into the prepared cake tin, smoothing the top with the back of a spoon. Bake for 45 min or until a skewer inserted in the middle comes out clean. Allow to cool in the tin for 5 min before transferring to a wire rack. Now make the lime icing by mixing 185 g icing sugar with 2 tbsp lime juice and 20 g melted (and cooled) butter until you get a thick mixture. Add a bit more lime juice if it’s too thick. 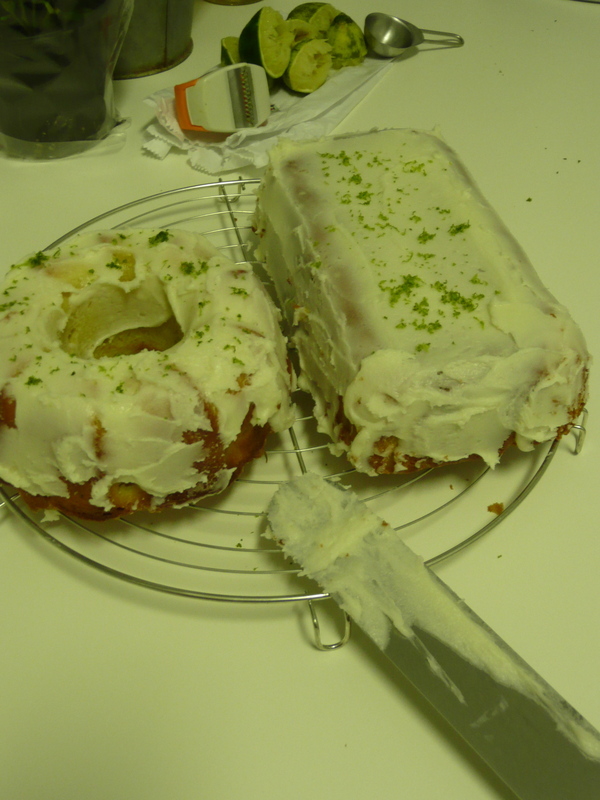 When the cake has cooled, poor over the lime icing and garnish with a sprinkle of lime zest. A final tip: don’t do this late at night or you will be too lazy to get the icing just right and instead of a gorgeous cake you get what you see in the picture. It still tastes as great though!